Dehydrated skin? 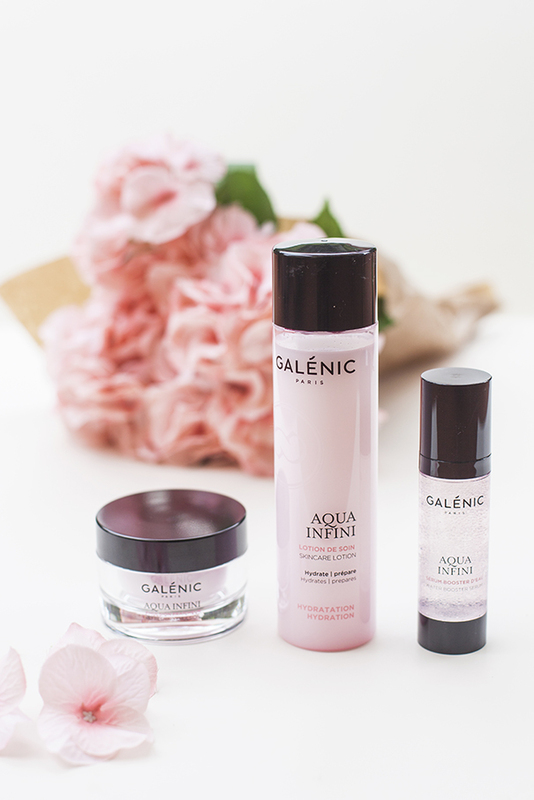 Here’s why, the remedies to fix it FAST and the Galénic products that I tried! Dehydrated skin. Is your face in need of more hydration? Do you have tight, dry skin? This is a very common problem, especially during winter, for me included, especially since my skin also breaks out in spots…. WHY IS MY SKIN DEHYDRATED? Skin dehydration has been well documented recently: our body is made up of 60% water, which decreases with age, to around 50%. Children, on the other hand, are about 80% water… and that explains why they have such soft skin! We are constantly losing water from our body: not just over time but also due to variations in temperature and air conditioning. So during summer our skin can get very dehydrated and ruin our beautiful looks! Argh!! WHAT SHOULD BE OUR AIM? We should be aware that we lose water with age, and so our skin’s beauty is physiological. But you can slow down the process by keeping your levels of hydration up. Also you should protect your skin from all external factors that could accelerate the loss of water (above all the famous ups and downs of temperature and air conditioning…). Basically, your skin should be constantly hydrated (never forget to take care of your facial skin!). Charm bracelet. I’ve always been fascinated by charm bracelets: they’re essentially bracelets which reveal your personality, through little charms that narrate our experiences, feelings, interests, travels… who we are and how we feel. 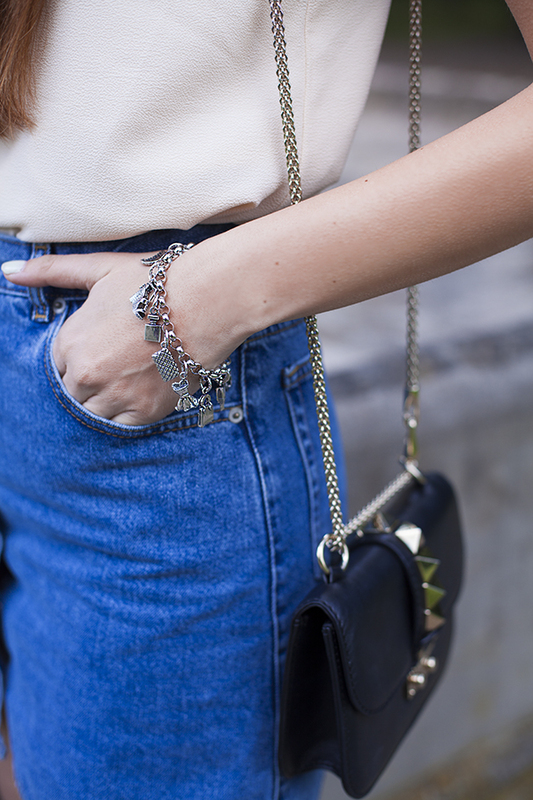 The charms are a way of expressing ourselves through jewellery! So for my charm bracelet I was very tempted by the glamour collection of charms by Giovanni Raspini (that I wore in this post, remember?). They are really original and fun, and I’ve decided to put together a little wardrobe of my charms… I’ve got one for everything! There’s everything from a bra to a perfume bottle to a dress to high heels and an IT bag of the moment! Isn’t it adorable? Charm bracelet: a bra, a perfume bottle, heels and an IT bag. Here’s my super fashionable bracelet! I’ve decided to pair it with a summery and feminine look. A pair of colourful sandals, a denim miniskirt, a basic shirt and a floral jacket. Mon Paris by Yves Saint Laurent Beauty. Love is the force that moves the world and the stars. War and peace are caused and resolved by mad stories of love and passion that take hold of our souls. That love is born from such insane passion and the only way to escape from it is to give into temptation. 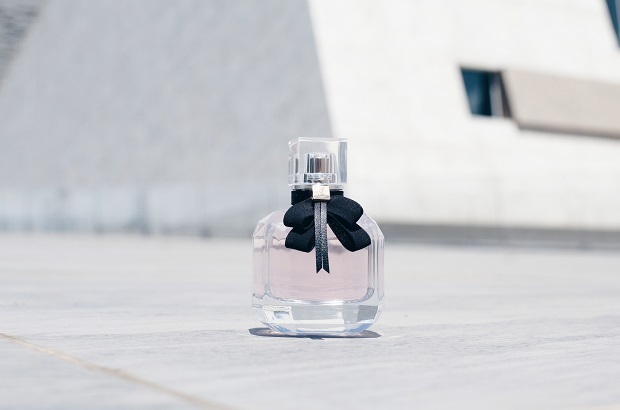 This unconventional, upside down love that breaks all the rules is the inspiration behind the new perfume of amour fou, of mad love by Yves Saint Laurent Beauty, Mon Paris. Mon Paris di Yves Saint Laurent Beauty is the new fragrance for women who are sure of themselves, free, and appreciate Paris for its modernity and metropolitan essence, and who are not afraid of loving fiercely and wholly with whomever they encounter, that make them unite, divide, enrage, calm and delight, and shout with happiness, pain and pleasure. 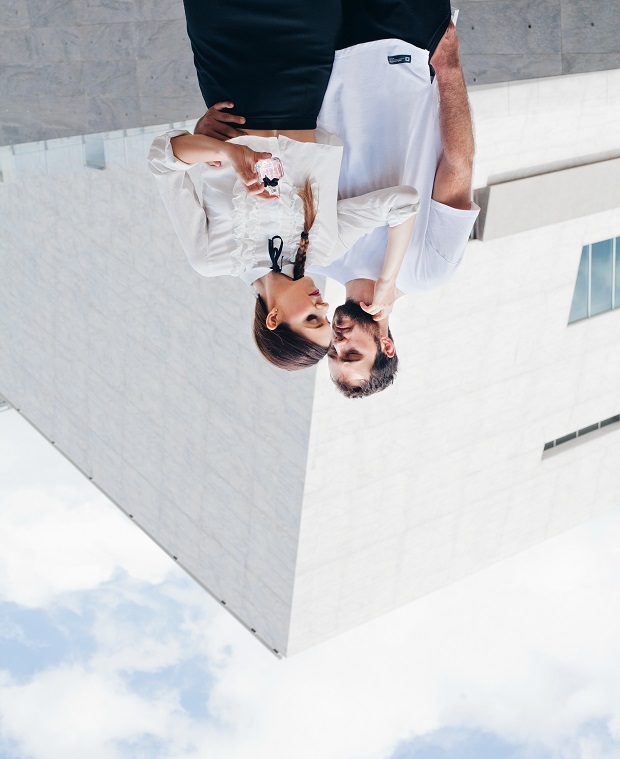 A love that is dizzying and that makes you fee like you are upside down on an endless rollercoaster. The love that I’m living. Mon Paris by Yves Saint Laurent Beauty and my mad love story! Like upside down love also in Mon Paris, the classic olfactory pyramid is turned on its head to highlight its fruity notes of raspberry, pear, strawberry and bergamot but also notes of the Datura flower: the narcotic flower which gives a very unique note to the fragrance. The first narcotic white chypre! The packaging is one of my favourites by Yves Saint Laurent Beauty. The silk lavallière bow is the protagonist with leather strings, held together with a little sparkly jewel: the tie is a symbol of the couture fashion of Yves Saint Laurent, and is now the symbol of a dizzying embrace that sweeps away all certainty but that binds you forever. This is my interpretation of “Mon Paris” and of my love story, which is a bit mad, and which unites and separates us, that makes your heart skip a beat. My special guest is my amour fou Giovanni Gambassi, photos by Gabriele Colzi. What to say to your hairdresser when you want a change. Good morning ladies!! How many of you are keen to change your hairstyle but are too scared to do it? The biggest fear is that your hairdresser won’t understand exactly what you want, and, after having spent lots of money (often ridiculous amounts.. I certainly know! ), you leave unsatisfied or worse, in tears, which has happened to lots of my friends. As you all know, if you want to change your hairstyle, whether it’s a slightly more drastic cut, or a big colour change, you must trust your hairdresser and most of all be confident enough to explain exactly what you want. This is the only way to get exactly what we had in mind… trust me! What to say to your hairdresser when you want a change: I did it correctly, and here’s the result! I’m always afraid of “putting my hair in the hands of someone else”: my long main is one of my most prized possessions, and I’ve been meticulously growing it and making sure it’s protected and nourished… so that it’s nice and soft if anyone touches it! But, I decided it was time for something new, be it a decent chop, an emergency trim, a new colour, highlights or something else… For all of these things, you have to find a hairdresser that you absolutely trust, who understands your ideas and can execute them exactly according to what you had in mind. But how on earth do you explain to your hairdresser exactly what you want? I went to Morena Acconciature, a great salon in Lucca that several of my close friends recommended to me. I’d never been to this salon, but I decided to trust the stylists and go for a change… and I did it correctly! Sara took fantastic care of me for an entire afternoon and after a cut and new colour… I left the salon feeling brand new and with a fab new hairstyle: or rather exactly the hairstyle I wanted! I’m so happy!!! But of course, you’ll know this already if you follow me on Instagram and Facebook. But how did I explain to the hairdresser what I wanted? Right, here’s what to say! White jumpsuit with culottes and a two-tone biker jacket: I’m obsessed! White jumpsuit with a two-tone biker jacket. Are you guys going through a “fashion obsession” this year? What are you loving? Here’s my obsession, and they’re called culottes – wide legged trousers that finish mid-calf or at the ankle. White jumpsuit with culottes and a two-tone biker jacket: my culottes obsession! Theses trousers are my everything. I have loads of them, and I’ve fallen for this fantastic white jumpsuit with culottes by LaMarca. I loved it the moment I saw it, because it has wide trousers (and so are pretty and flowing when you walk!) but also is sleeveless which is a feminine contrast to the trousers. Find it HERE on the LaMarca website. I decided to pair it with a two-tone biker jacket, also by LaMarca, that I bought a while ago that you will have seen on my Snapchat (find it HERE). So what do you think of this look? Are you also obsessed with culottes?